There are two types of malayalam fonts ASCII and Unicode. There are lot of malayalam fonts available in ASCII and Unicode format. Some of them are Proprietary and some of them are released on GNU/GPL License. Lot of Malayalam unicode fonts are available for free download. Anjali Old Lipi, Meera, Manjari, Rachana, Dyuthi, Keraleeyam, Uroob, Chilanka, Karumbi, Kalyani, Raghu, Suruma, Noto Sans, Sokanasini, Deshabhimani, Samathwa, Kayyoor, Nellu are the Malayalam Fonts Listed Here for free download. They are free to download and use. All these fonts are released under open license. 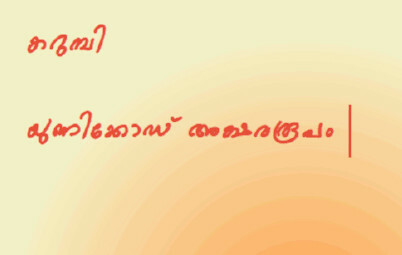 Anjali Old Lipi is a regular malayalam font created by Kevin and Siji. 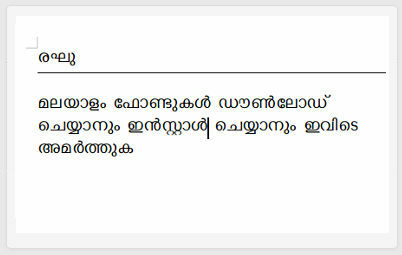 Current Version of the font is 6.1.1. it is an orginal Malayalam script with Unicode mapping and Opentype features. Copyright - Digitized data copyright © 2004 Kevin & Siji, 2008 Hiran Venugopalan, 2014 Rajeesh K Nambiar, Swathanthra Malayalam Computing. This Font Software is licensed under the SIL Open Font License, Version 1.1. 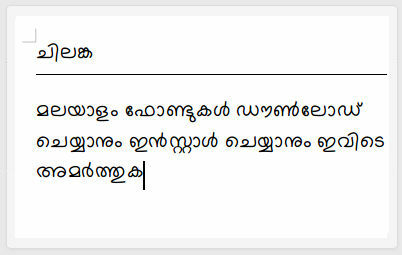 Meera is a Malayalam traditional script font created for the GNU system. It is a Medium OpenType font. The inspiration for this font is drawn from Rachana Aksharavedi. Mr.Hussain K H, The designer of popular Rachana fonts for Rachana Aksharavedi and an ardent supporter of traditional Malayalam orthography. Suresh P, A free software enthusiast and hobbyist). Swathanthra Malayalam Computing - A free software collective engaged in development, localization and popularization of various free software for Malayalam. 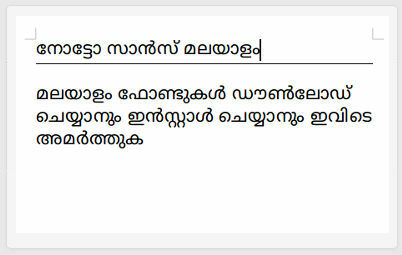 Manjari is a Malayalam unicode font created by Santhosh Thottingal. Manjari font is available in Regular, Bold and Thin variants. It is an OpenType font. The font is released by SMC. 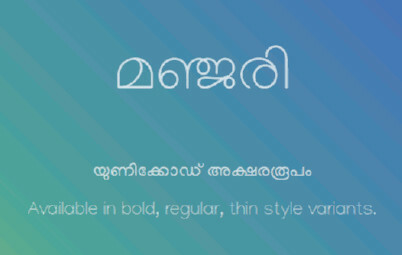 Rachana is a traditional Malayalam font created by Rachana Akshara Vedi in 2005. It contains exhaustive character set of Malayalam and is primarily created for the GNU/Linux system. Current maintainers of this font are Mr.Hussain K H, Suresh P, Santhosh Thottingal, Rajeesh K Nambiar and Swathanthra Malayalam Computing. Rachana Bold is created by designer of Rachana font, K.H Hussain . Opentype featuring is done by Rajeesh K Nambiar. 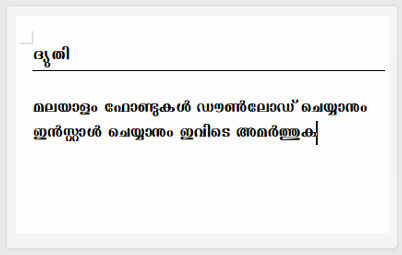 This font is developed and maintained by Swathanthra Malayalam Computing. Rachana bold is developed with the financial support from International Centre for Free and Open Source Software (ICFOSS), Govt of Kerala in 2014-15. The license of Rachana font is GPLv3 or Later+ Font Exception and Rachana Bold is OFL 1.1. Keraleeyam is a Bold letter Malayalam font created by Hussain KH and SMC. Keraleeyam font was first designed as an ASCII font in 2005 and distributed with Rachana editor. This Unicode font is based on Rachana's exhaustive character set of traditional Malayalam Lipi is totally redesigned as a part of the Grant (2014-2015) received from India Foundation for the Arts, Bangalore under Arts Research and Documentation Programme. The font is dedicated to the environmental activism in Kerala. Uroob is a Bold letter Font created by Hussain KH and SMC. The font is Developed with the financial support from International Centre for Free and Open Source Software(ICFOSS), Govt of Kerala in 2014-15. Uroob font is Dedicated to Uroob (P.C. Kuttykrishnan), celebrating the 60th anniversary of Ummachu. Digitized data copyright(c) 2015 Hussain KH, Kavya Manohar, Rajeesh K Nambiar, Santhosh Thottingal, SMC. This font is Licensed under SIL Open Font License, Version 1.1. 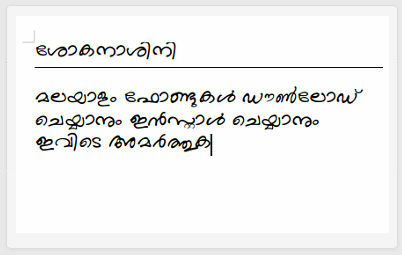 Chilanka is a handwriting font for malayalam created by Santhosh Thottingal. It supports traditional Malayalam Script and old style writing of complex letters. 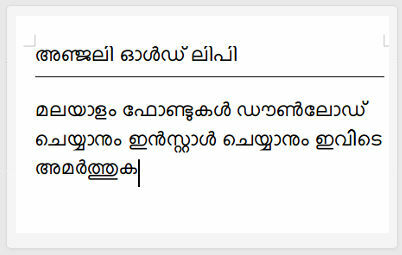 This is a beautiful handwriting font in malayalam with latest unicode support. Digitized data copyright (c) 2014, Santhosh Thottingal, Kavya Manohar, Swathanthra Malayalam Computing(http://smc.org.in) with reserved font name "Chilanka". 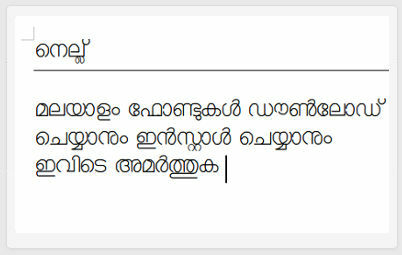 Karumbi is a handwriting font for malayalam created by Kevin and Siji, Santhosh Thottingal. It supports traditional Malayalam Script and old style writing of complex letters. This is a Malayalam unicode font. Digitized data copyright (c) 2005-2016 Kevin and Siji, 2016 Santhosh Thottingal, 2015-2016 Swathanthra Malayalam Computing(http://smc.org.in). Kalyani is a regular Malayalam Unicode Font created by Shaji N V in 2002. 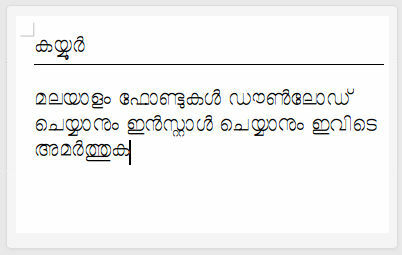 This font is the first unicode font in Malayalam language. It was created by Shaji N V in 2002 from TeX archive font created by Jeroen Hellingman using a tool named Pfaedit. In 2003 Baiju M added GSUB tables to the font and renamed it as MalOtf.ttf .This was the default font in Sopananam GNU/Linux, (first GNU/Linux custom distribution with Malayalam Inteface) released as a part of UNDP-KBIP-FSF India project. In 2008 Hiran Venugopalan modified the font and added missing glyphs, feature tables and made it compatible to unicode 5.0. Copyright (C) 2002 Shaji N Vyapron, Jeroen Hellingman. Copyright (C) 2008 Hiran Venugopalan,Swathanthra Malayalam Computing (http://smc.org.in). The font is licensed under GNU GENERAL PUBLIC LICENSE V3 with Font Exception. RaghuMalayalam font Original Version 1.00 (2005) has been designed and developed, by Prof. R. K. Joshi (TypeFont Design Director, Visiting Design Specialist at C-DAC Mumbai) in association with Mr. Rajith Kumar K. M. (TypeFont Designer), assisted by Mr. Nirmal Biswas, Ms. Jui Mhatre and Ms. Supriya Kharkar at C-DAC Mumbai (formerly NCST). In 2008, developers from swathanthra Malayalam Computing started maintaining the font as a tribute to him. Suresh P modified opentype tables and added more glyphs to make it compatible with modern rendering systems. Reghu Malayalam Sans OpenType font is Licensed under GNU GPL V2. 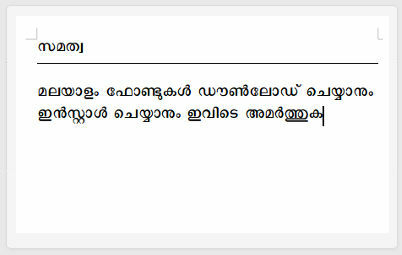 Suruma is a regular Malayalam font created by suresh p on 2007. Suruma-3.2.1 is a rehash of earlier releases. The earlier idea of akhand conjuncts for *RA *LA forms is revisited and implemented again with the new opentype specs. The new specs do away with statically-assigned character properties (by the shaping engine) for consonants. Instead, they are font dependent. i.e., post-base forms, below-base forms etc. are all decided by the the font itself. This concept was also used in the initial version of suruma font. Digitized data copyright,2007-2009 Suresh P Swathanthra Malayalam Computing(http://smc.org.in,http://savannah.nongnu.org/projects/smc). License is GNU GPL V3 with Font Exception. Noto Sans is a font created and maintained by Google in various langauges. Noto Sans Malayalam is the Malayalam version of the font. This font is a Malayalam new lipi font. Current Version is 1.03 and the font is designed by Monotype design team in google. 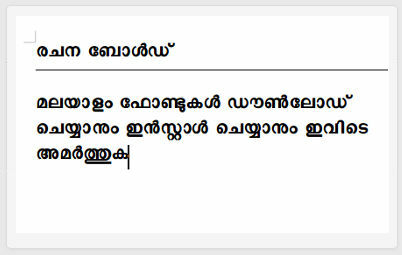 Deshabhimani is a Malayalam regular type font created by Deshabhimani Malayalam Daily. The font is Licensed under SIL Open Font License Version 1.1. Current font version is 0.2. 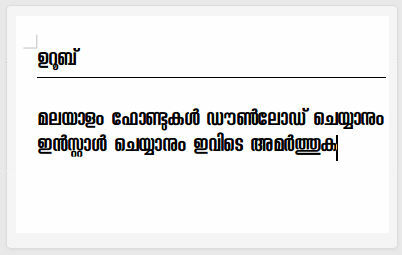 Malayalam Unicode Fonts are required to view malayalam in web browser. Most of malayalam unicode fonts are available for free due to its open license. 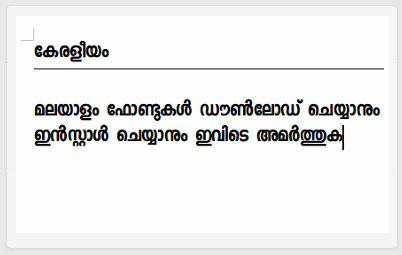 Most of the malayalam fonts are provided by Swathanthra Malayalam Computing. 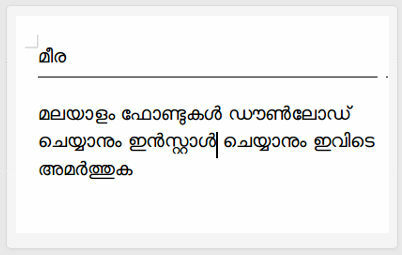 All the Malayalam Font Preview are listed on the Malayalam Fonts page of SMC Website. 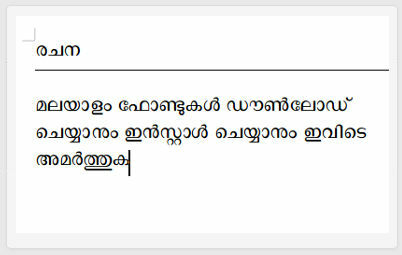 To install a Malayalam font on the computer first download a Malayalam font. Then open the downloaded font on a font viewer. In Windows and Linux font viewers are now included by default. Then press Install button on the font viewer. On Windows XP copy the downloaded font into c:\Windows\fonts directory. Lot of Malayalam ASCII fonts are available. Most of the fonts are Proprietary. The majour number of fonts are came from CDAC with their malayalam typing package ISM GIST. Popular news papers in malayalam like Malayalamanorama (manorama.ttf), Deepika has their own fonts. To read these news paper websites the corresponding font must be installed on the computer. 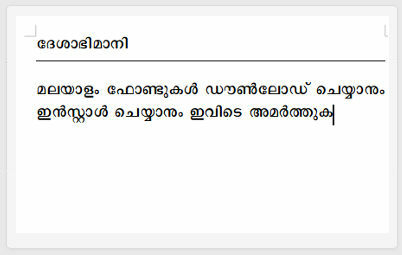 Malayalam web fonts are used to overcome this problem. Also these malayalam fonts have their own keyboard layouts. Special softwares are used to create malayalam content in these fonts. langaugetype.com provides a Set of tools to read and write popular languages in internet. Online Language tools helps to handle these languages effectively. The translitration tool is built with the google translitration api and translation done using google translate. 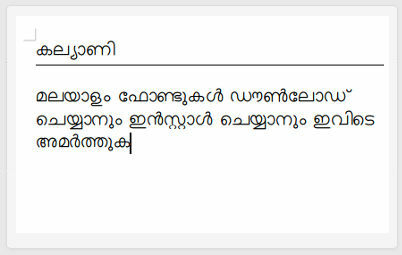 manglish to malayalam typing is done by using malayalam typing keyboard and malayalam typing software. 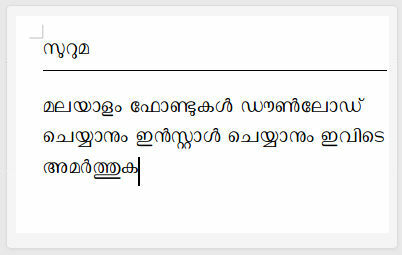 This malayalam typing app is used in a browser.